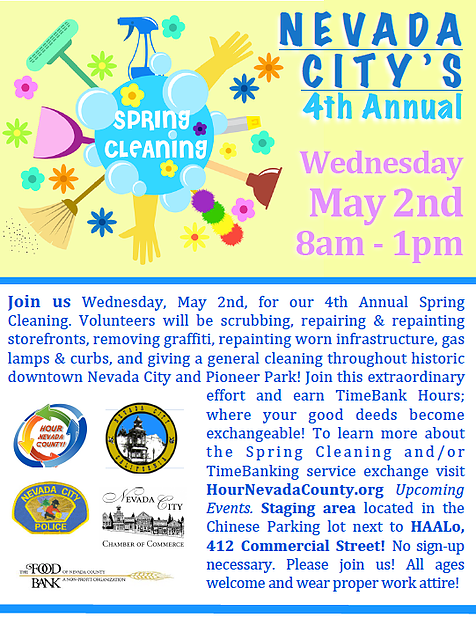 NEVADA CITY, Calif. April 23, 2018 – The City of Nevada City in partnership with the area’s only TimeBank, Hour Nevada County, will be undertaking its 4th annual city-wide spring-cleaning, Wednesday, May 2nd, 8am-1pm. The City of Nevada City, the Nevada City Police, Fire Department, Public Works, non-profits, Hour Nevada County, the Nevada City Chamber of Commerce, local service clubs, neighbors and downtown businesses will be pulling out their tools for the undertaking. The first city-wide Spring Cleaning was launched March of 2016 with approximately 175 volunteers. Once again this year, residents and business owners will be asked to step up and remove graffiti, repaint gas lamps, fire hydrants, and street curbs as well as weed-eat, remove trash, and clear hedges along sidewalks. The city of Nevada City will be providing tools and equipment. 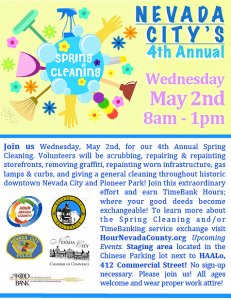 This year the Spring Cleaning will be focused on downtown Nevada City and the 7 Hills District. Store owners that would like to have their storefronts freshened with a coat of paint by volunteers should contact Reinette Senum, at reinettesenum@gmail.com, no later than May 1st . Store owners are asked to provide the paint, the volunteers will do the rest. Event organizers highly recommended that volunteers wear the appropriate clothing and bring the tools for the type of jobs they would like to undertake, i.e. paint or scrub brushes, pruning shears, rakes, brooms, buckets, paint trays and rollers, etc. Though tools and equipment will be provided it is first come first serve. No need to sign up in advance. The check-in and staging area for volunteers will be located in the Chinese Parking Lot next to HAALo, 412 Commercial Street beginning at 7:30am. All volunteers are asked to check in at this location to sign release forms and for directions. The City will be providing breakfast snacks as well as coffee and tea donated by the Food Bank of Nevada County. For more information go to: https://www.hournevadacounty.org/upcoming-events Please join us in this extraordinary event! All ages welcome!